You’ll want to take some time answering that. Decisions about things like race and class can influence your experience in some significant ways, including available skill trees and story elements. 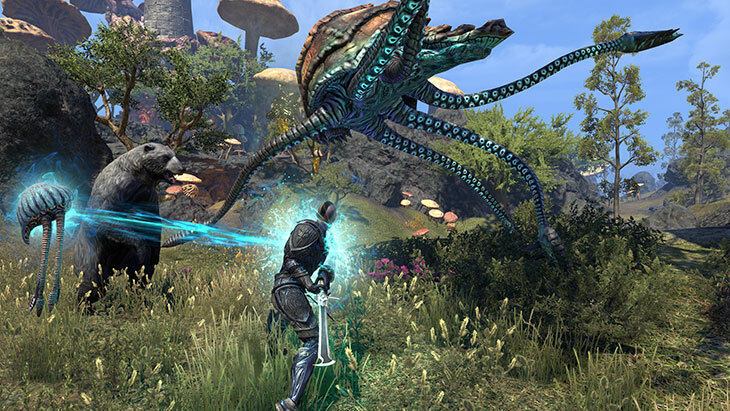 Fortunately, carefully crafting a character is one of the great joys in any role-playing game, and ESO is no exception. Now, if you’ve played previous Elder Scrolls games – especially The Elder Scrolls V: Skyrim – this process will look fairly familiar. You’ll start off by picking your race and gender, then you’ll choose a class, and finally you’ll customize your appearance. But there are some differences that longtime fans of Skyrim and the original Morrowind should be aware of, so let’s take a closer look. 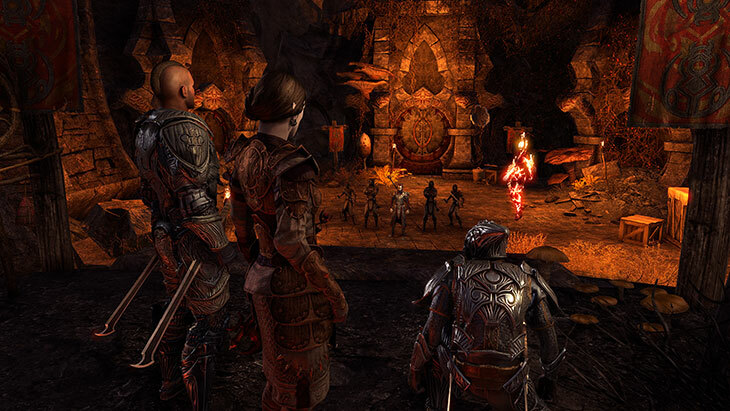 In The Elder Scrolls Online, each of the nine main races is tied to one of three Alliances. 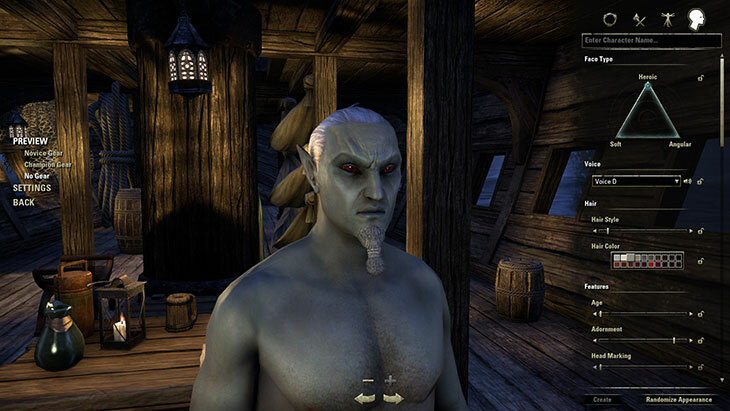 Bretons, Orcs and Redguards make up the Daggerfall Covenant; High Elves, Wood Elves and Khajiit are members of the Aldmeri Dominion; and Argonians, Dark Elves and Nords are joined together in the Ebonheart Pact. When starting Morrowind, you begin on a ship en route to the volcanic island of Vvardenfell – regardless of which race you choose. Of course, you’re free to wander all over Tamriel right from the start, so if you’d prefer to immediately jump past the introductory areas and begin your adventure elsewhere, you’re welcome to do so. But if this is your first time in The Elder Scrolls Online, Morrowind’s story-based tutorial is a great entry point. One other element of choosing your race should be familiar to Elder Scrolls aficionados: Each of the nine races has a particular set of bonuses and special abilities. Khajiit, for example, are particularly agile, while High Elves have a particular affinity for magic. To be clear, any race can take on any class with no trouble whatsoever. It’s just that some races might do a smidge better in some classes. Speaking of classes, once you’ve chosen your character’s race, you’ll need to decide what discipline he or she is going to specialize in. With Morrowind, you have five choices: the Dragonknight, who mixes offensive magic with melee combat; the Sorcerer, who wields staffs along with powerful magic and summoning abilities; the Nightblade, who specializes in stealth and assassination; the Templar, who backs up melee combat with healing magic; and the all-new Warden, exclusive to owners of Morrowind, who summons magical animals, has nature healing abilities, can blasts enemies with frost spells – and is also no slouch in close-quarters combat. Each of these classes confers a set of three unique skill trees. But it’s crucial to remember that twenty-eight other skill trees are available to all characters, regardless of class. 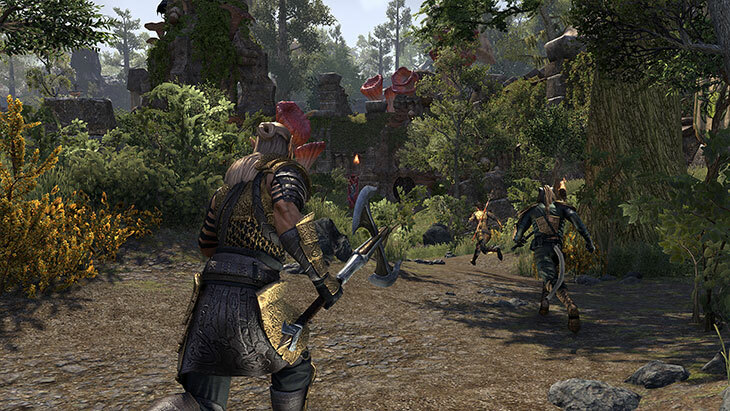 From weapon specialization to crafting, you can build your character however you choose, no matter what decisions you made when creating him or her – a hallmark of previous Elder Scrolls games. Want to play as a Sorcerer who dons heavy armor and swings a two-handed greatsword? Go right ahead. A Nightblade who’s a fiend with a destruction staff? Sure thing. A Dragonknight who specializes in ranged attacks? Knock yourself out. Of course, it wouldn’t be an Elder Scrolls game if you couldn’t customize the appearance of your character to an almost ridiculous degree, and ESO has the goods here. You’ll start with a triangular slider to pick your character’s basic physical frame, finding your ideal balance between large, thin and muscular. Then you get to make much more granular decisions about your character’s overall appearance, from height to skin color to the size of your feet. And then it’s on to customizing your avatar’s face. Another slider lets you select the basic features, balancing soft, angular and heroic looks to your own taste. Then you’ll want to pick hairstyle, age, eye color and the like. But why stop there? You can tweak facial features in minute detail, from the slope of the forehead to the tilt of the eyes. Ear height, nose width, cheekbone size – the options are extraordinarily extensive. Or you could click Randomize Appearance and let fate decide your character’s appearance. The amount of time you choose to spend here is entirely up to you. Just make sure you’re happy with the result, because you’re likely to be looking at your character for many, many hours. Once you’re satisfied with your creation, you can begin the game in earnest, setting out to explore Morrowind and the rest of the vast world of Tamriel. But your choices about your character have just begun. What you’ve created so far is akin to a roughly shaped lump of clay, and it’s up to you to decide how you want to sculpt it. 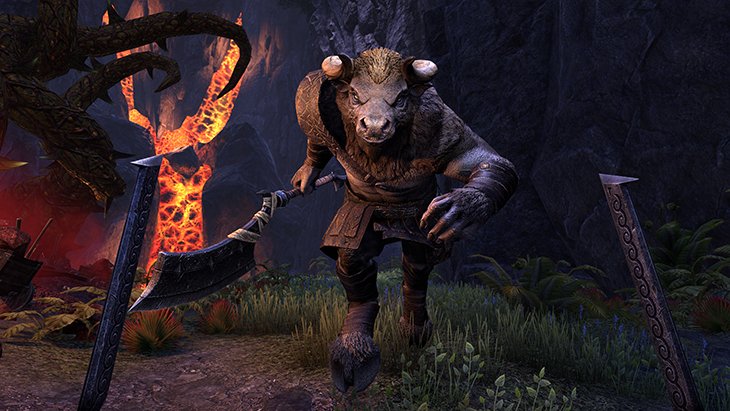 Just about everything you do in ESO will help shape and advance your character. Kill a monster while you’re armed with a weapon in each hand and you get access to the Dual Wield skill tree, which features deadly multi-strike and area attacks. Equip a few pieces of heavy armor and you unlock the Heavy Armor skill tree, which you can use to buff your damage resistance and health. Dismantle a piece of light or medium armor and you’ll level your Clothier abilities, which let you craft and improve your light/medium armor. In other words, the game is just loaded with ways to expand and improve your character’s abilities. Mix a potion? There’s a skill tree for that. Cook a meal? Skill tree. Steal a villager’s inkwell? Behold the Legerdemain skill tree, which makes it easier to sneak, pickpocket and unload ill-gotten goods. The near-endless variety in character customization is exhilarating, especially early on as you’re opening up one new skill tree after another. At this point, you’re going to want to experiment with all the available skills to see what works best for your play style. There’s no downside to jumping around in the early hours, no atrophy in one skill if you focus on another. Meanwhile, as you’ve been experimenting, you’ve been leveling up and acquiring points to assign to your unlocked skills. Now it’s time to home in on the mix of skills that works best for you! Sticking with one type of weapon (e.g., sword-and-shield, dual-wield, two-handed) and one type of armor will let you focus your upgrades in those skill trees, giving you access to more powerful options for attack and defense. Similarly, focusing on just one of your class skill trees will let you maximize the power and effect of your favorite set of abilities. 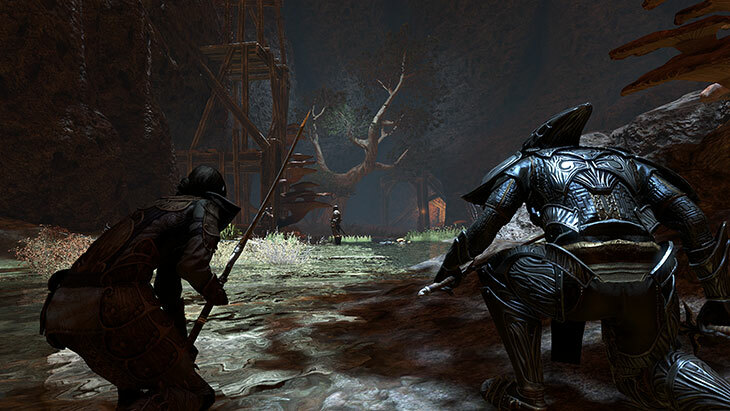 The Slayer: A Templar who specializes in the Aedric Spear skill line can be an absolutely devastating damage-dealer. Equip her with light armor and a pair of dual-wielded weapons and she can stick-and-move with the best of them – and skills like Puncturing Sweeps can keep her on her feet with self-healing abilities. The Brute: A Dragonknight’s Draconic Power gives him all kinds of top-shelf defensive options. Give him a set of heavy armor and a shield and he can withstand an absurd amount of damage, letting his teammates flank enemies who are beating themselves senseless against his defense. The Sneak: A nasty little Nightblade can make things very unpleasant for enemies when their attention is elsewhere. Judicious use of Sneak and the Shadow skill tree can keep her off enemies’ radar while she gets close enough to jam her dual-wielded swords into their backs – or she can just hang back and attack with a bow from stealth, enjoying hefty bonuses to damage. The Support Staff: If you have any intention of grouping up with other players, this is a fantastic option. A Sorcerer can use his Dark Magic skills to immobilize, weaken, and otherwise harass enemies. Pair those spells with a Restoration staff and he can also help out the team with serious healing abilities. The New Hotness: If you’re venturing into Morrowind, you simply must try the entertaining new Warden class. Her Animal Companions skill tree lets her summon mystical beasts for a variety of purposes, from a Magicka-replenishing Betty Netch to the Feral Guardian – a bear who will fight independently by her side. Start her off with a sword and shield, and then add a bow into the mix once she hits Level 15 and can swap weapons on the fly. Once again, these are just suggestions; what’s important is finding a build that suits you and your play style. 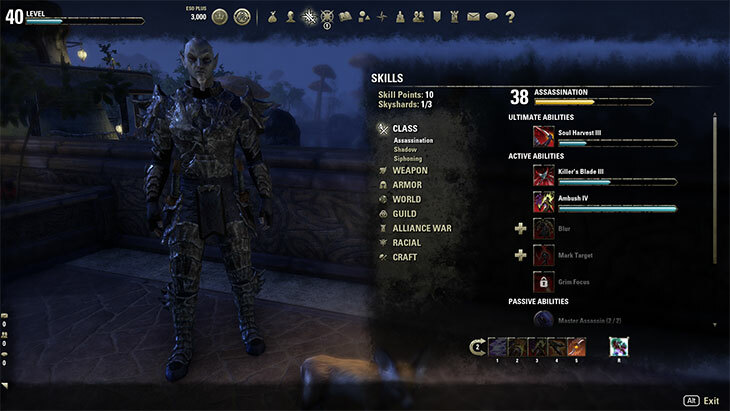 If you plan to play solo, for example (something that’s wonderfully easy to do in ESO), you may want to take a little more care to balance offensive and defensive abilities. Conversely, if you plan to adventure in a large group, you can specialize even more narrowly – provided your teammates are filling in any gaps. Whatever you choose, you also have the option to completely re-spec your character at any time for a little bit of gold. The most important thing, of course, is to craft a character you enjoy adventuring with. Fortunately, figuring out what that means for you is a fun adventure in itself.